Due to Internet access problems at Low End Mac headquarters and the publisher's work schedule at his other job, we were unable to post The 'Book Review last Friday. We hope to recover from the holiday schedule and resume our normal publishing schedule on Wednesday. Fixing Your PowerBook G4 15"
Apple has posted links to PDF files that contain instructions for installing replacement parts in the 12" PowerBook G4 computer. PowerPage has posted a tutorial by Russ White from Small Dog Electronics that walks you through the process of installing keyboard backlighting on Apple portables using Electro-Luminescent (EL) sheeting, the same type of material used in the backlight for Timex Indiglo watches (Apple's 17" PowerBook uses fibre-optics for keyboard backlighting). "The advantage of EL is that it generates a uniform light over its entire surface. The sheet itself generates almost no heat, and the sheet is about the thickness of some heavy paper (card stock), so it can fit behind the keyboard without any need to rework the case or keyboard." Also on PowerPage is another Tech Tails reprint by Troy Kingsbury of Small Dog on how to repair titanium PowerBooks that have come unglued, have latch problems, or get scratched. The new Mission Light 17" PowerBook case is a lightweight, economical solution for safely transporting your Big Al PowerBook. 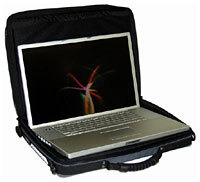 The simple effective design offers excellent protection for you PowerBook in a clean, lightweight case. Clean, lightweight and flexible design. Reinforcement on the handle side and 4 mm (1/8") hardboard on the bottom. Exterior 600 denier polyester and interior 200 denier nylon both of which are urethane coated for waterproofedness. The fabrics give an excellent balance between superb protection and durability and light weight. Excellent shoulder carrying comfort insured by a wide, contoured, thickly padded shoulder strap. Heavy duty mountain bike style briefcase handle double rivet reinforced (on each side) through the wrap handle to insure the safety of your laptop. Convenient DVD, CD-ROM & cable pockets located in the laptop section for easy access plus extra room for manuals or other letter sized paperwork on lower accessory level. Outer front organizer panel with pockets business cards, pens, elasticized pocket for the Apple power supply plus room for the power cord and an ethernet cable. Outside flat, outer pocket for airline tickets, thin paperwork, etc., flat external rear pocket especially handy for maps, magazines or newspapers. a velcroed elastic strap to lock down 17" PowerBook and 1.2 cm ( 0.5") of paperwork for further protection. Handy mesh pocket in the lid for safe and convenient storage of cables or other thin items. Luggage feet riveted through the hardboard bottom of the case which actually keep it up and off the ground when you want to set the case down whilst entering and leaving your vehicle. Pricing: $125 Cdn./$ 91 U.S.
Mac and Windows Laptop users can now experience the cutting edge of FireWire 800/1394b with the OrangeLink FireWire 800 for Notebooks from Orange Micro. FireWire 800/1394b is steadily gaining popularity because it allows data transfer rates of up to 800 Mb/sec. External hard drives, digital audio, digital video, and other high speed peripherals will benefit tremendously from the increased throughput of FireWire 800 while still enjoying the "plug and play" and "daisy chain" conveniences that have characterized FireWire since its inception. At press time, the only laptop shipping with native FireWire 800 ports is the 17" PowerBook, which has a list price of $3,299. What are the rest of us laptop users to do? 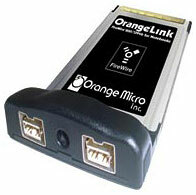 Orange Micro has come to the rescue by creating the OrangeLink FireWire 800 for Notebooks card. Put this card into your Mac or Windows laptop, and you can instantly start enjoying the benefits of this new technology. "The response to our FireWire 800 line of products has been overwhelmingly positive," stated Arthur Scotten, president of Orange Micro. Besides the obvious benefit of FireWire 800/1394b's speed, there are many other reasons why it is becoming the most popular connectivity solution: plug and play convenience, backward compatibility with the previous FireWire 400/1394a standard, daisy-chain capability, and up to 45 watts of bus power that can be provided through the connection. The OrangeLink FireWire 800 for Notebooks card is equipped with two 9-pin FireWire 800/1394b ports so users can simultaneously use two FireWire 800/1394b devices. Backward compatibility with legacy FireWire devices require only a 6-pin to 9-pin adapter or 6-pin to 9-pin cable (both available in Orange Micro's line of FireWire 800 products). The OrangeLink FireWire 800 for Notebooks (product #70HTL00050) carries a MSRP of $89 and will ship on September 30, 2003. Video editing software is included with the package. The OrangeLink FireWire 800 for Notebooks is compatible with Windows 98SE, Me, 2000, and XP with included Orange Micro driver. FireWire 800 support is included in Mac OS X (10.2.4 or newer). To provide the full bus power to peripherals, Orange Micro also has an optional external power supply available it is available for purchase from the Orange Micro Online Store. Thousands of people open their PowerBooks on a daily basis and are discouraged to find mysterious marks and smudges on their laptop computer screens. Some of the marks are easily removed from the screen with a swipe of a cleaning cloth, while others remain as permanent reminders of how a small problem can turn into a big problem for possibly the most powerful laptops in the industry. The mysterious marks are not so mysterious however. The marks are actually caused when oil and dirt left on the keyboard and/or wrist-rest come in contact with the computer screen when the laptop is closed. The marks can be easily prevented with the help of a laptop screen protector from Koverz, Inc.
"We have customers from across the country that have recognized the marks on their screens, and have chosen a simple, yet elegant solution to their problem," said David Leishman, president of Koverz. "At Koverz, we have created a leather laptop screen protector that fits perfectly over the keyboard and/or wrist-rest of most Apple PowerBooks and iBooks. The result is a protective barrier that prevents the dirt and oil on the keys from coming in contact with the delicate LCD screen." Koverz laptop screen protectors are made from 100% cowhide leather, which will not bleed or shed and is the most durable material for this type of product. The topside, which faces the screen features a chrome finish, and the bottom side is unfinished suede. "We have been contacted about our screen protectors by everyone from individual computer owners to universities that purchase large quantities of Apple laptops," Leishman said. "In some cases, people, schools, universities or companies are spending upwards of $3,000 for an Apple laptop, and for less than 1% of the cost of the computer, owners can purchase a Koverz laptop screen protector and insure that their laptop screen will last as long as the rest of their investment." The Koverz laptop screen protector is available for most Apple PowerBooks and iBooks. Pricing ranges from $11.95 to $15.95. Koverz offers volume discounts, as well as customized laser etching. Toshiba Storage Device Division has introduced two slim-line optical disk drives that provide higher media recording speeds for mobile computers and allow computer manufacturers to deliver better functionality to professionals on the go. The SD-R6112 slim DVD recordable drive enables mobile users to take advantage of 2x DVD recording, while the SD-R9012 super slim CD-RW/DVD-ROM combination drive delivers 16x CD recording speeds in a petite 128 x 9.5 x 126.1 mm format. "As more and more computer users transition to mobile PCs, they're demanding desktop performance in a mobile package," said Maciek Brzeski, vice president of marketing at Toshiba SDD. "Toshiba's new optical disk drives help OEMs continue to build lighter, thinner and more functional mobile computers even as some system components, like display screens, grow larger." The Toshiba SD-R6112 drive supports 2x DVD-R, 1x DVD-RW, 1x DVD-RAM read, 16x CD-R, and 10x CD-RW, allowing users to take advantage of multiple technologies in a single drive. The SD-R9012 supports 8x DVD-ROM, 16x CD-R, and 10x CD-RW. Both drives include buffer underrun technology and a 2 MB buffer. The tray loading drives are also shock resistant and feature low energy consumption, making them ideal for laptop design. Toshiba's SD-R6112 and SD-R9012 slim-line drives will begin shipping to mobile PC manufacturers in late August. CharisMac Engineering's FireDino, the world's most ferocious 4-port FireWire hub, is available again for a limited time. The award-winning hub is once again ready to wreak havoc in your office while helping you keep all of your FireWire devices conveniently connected to your Mac computer. "Yes, we've received a new batch, and these units seem particularly rambunctious," said Jim Schroeder, head of CharisMac's support team and in charge of quality assurance. "I definitely have mixed emotions with these dino's entering the field; I'm not sure whether to be excited for the lucky recipient or to be frightened for them." The platform independent FireDino provides 4 data ports neatly tucked away in the back of the ferocious beast. The FireDino is bus powered; however, CharisMac offers an additional power adapter for an extra charge. The FireDino requires no additional drivers, although food and water may be necessary to keep your FireDino happy. The FireDino first shipped in September of 2002 and quickly sold out. Three additional batches have been quickly sold through since the holiday buying season and CharisMac expects that these will once again go quickly. The FireDino has received numerous awards and accolades, including Mac Addict Magazine's Editors Choice award. The FireDino has also been featured on Inside Mac Radio and on the Screen Savers TV show, found on the TechTV channel. The FireDino is available for $69.95 directly from CharisMac Engineering via their online store. The FireDino will be available for a limited time only and will be sold on a first come first serve basis. The Addlogix FireXpress800 350DX is powered to convert any IDE hard disk drive into the fastest FireWire800 enabled external storage device. The FireXpress800 350DX features a USB 2.0 interface (which is fully USB 1.1 compatible) and the FireWire800 interface work with Mac and PC operating systems. The data stored on the drive is fully accessible with either interface and does not require special partitions. FireXpress800 350DX supports large capacity hard drives in both FireWire and USB interfaces, and is compatible with the latest large capacity ATA-6 hard drives with full support. The conversion kit includes premium IEEE 1394b (Beta and Bilingual) cables, USB 2.0 cable, driver software, AC power cable and AC adapter. "Hitachi Global Storage Technologies is delivering a tiny 4 GB hard drive to electronic device manufacturers for testing. "The 4 GB Microdrive, a miniaturized version of a hard drive used in PCs, can be used by a wide range of devices to store data files for computers or image files for digital cameras, among other uses, the company said. The San Jose, Calif., hard-drive maker is offering samples now and plans to ship the 1-inch drive in volume in November." Prices at Mac Outpost in Canadian dollars.